Great War burials usually conjure up images of some corner of a foreign field that is forever England. More prosaically, many WWI servicemen came home to die and were buried streets away from where they were born. 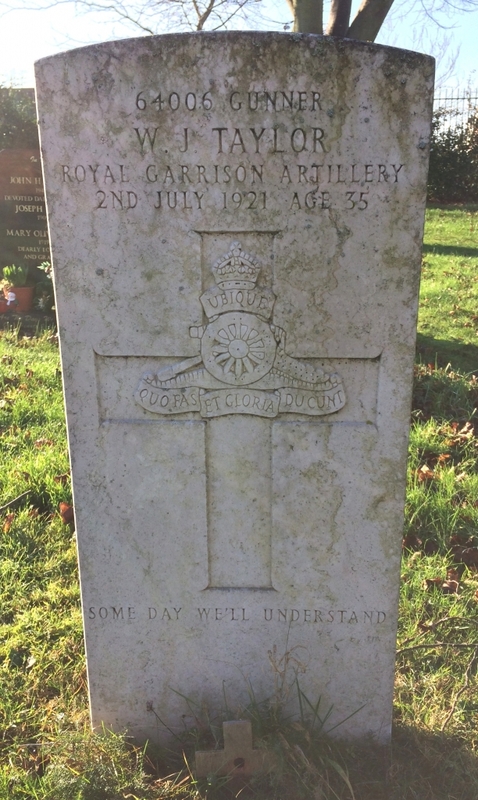 Although there are Commonwealth War Graves Commission headstones in cemeteries across the U.K., the identities of those engraved are often unknown a hundred years later, especially if their names are not shown on the local war memorial. Radcliffe on Trent cemetery is unusual in having more CWGC graves than neighbouring Nottinghamshire villages. Bingham, for instance has four, Burton Joyce has two and West Bridgford has one grave (see www.cwgc.org). Radcliffe has twelve graves displaying the same CWGC headstones as those found in CWGC cemeteries abroad. The Commonwealth War Graves Commission maintain these headstones and visit the cemetery to ensure they are kept in a good condition. The cemetery has two family graves in which local servicemen are interred. There are also two graves, now grassed over, for servicemen who died in the village and a headstone for a serviceman who died in France. A further three men, Robert Hallam, John Nowell and Bertie Todd, who were all killed in action in France, are remembered on family graves. Radcliffe’s sixteen WWI graves are scattered around the grounds (one grave is a double one). Why were these people buried in the village and not in theatres of war? Our research shows most of them served on the Western Front and came home unwell. Some served in the U.K. where they became fatally ill. The farthest end of the cemetery is dedicated to patients who died at Notts. County War Hospital, a temporary hospital based in Notts County Asylum, which is often referred to as Saxondale hospital. Twenty-nine military patients died when the war hospital was open between July 1918 and August 1919. 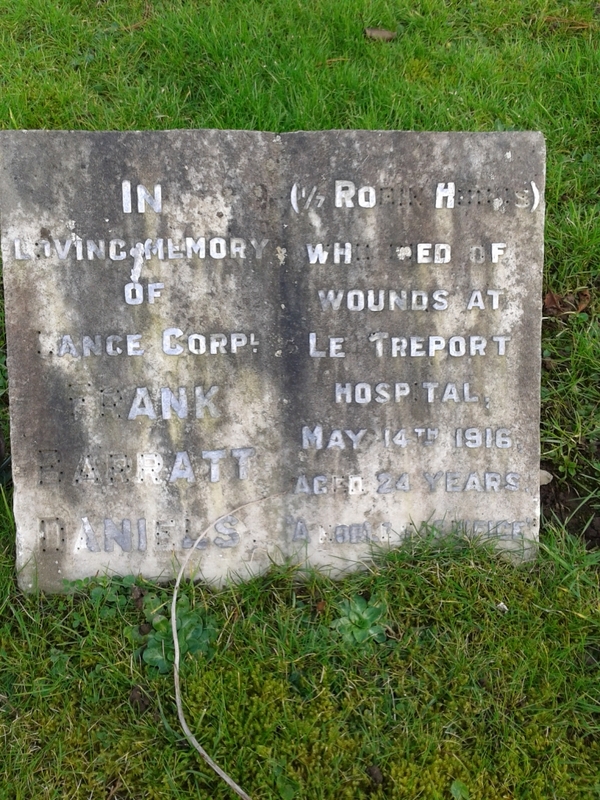 A commemorative headstone at this end of the cemetery reads: ‘In memory of the patients who died at the Notts. County War Hospital 1918–1919’. Radcliffe on Trent Local History Society has confirmed that it is a memorial and does not mark the site of unnamed graves. 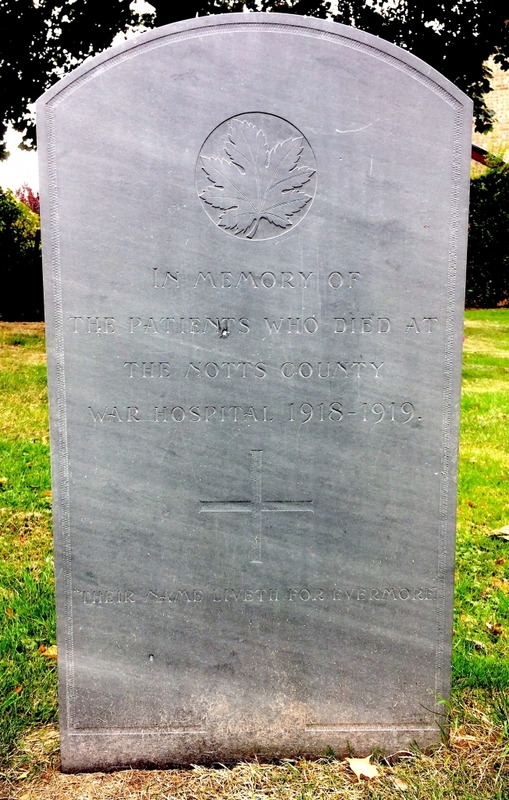 The headstone was paid for by Notts County Asylum authorities from the residue of money collected for the ‘comforts for soldiers’ fund during the time the asylum operated as a war hospital. Eighteen patients who died at the hospital and are buried in their home towns have been identified. Frederick Bennett, Bernard Clarke, Frederick Cowley, William Donkin, William Foley, Joseph Gleave, Albert Lydiate, Clarence Mifflin, Charles Moody, Arthur Orchard, Rhoderick Parkin, Harold Parry, Herbert Robinson, Robert Robinson, Albert Simmonds, Alfred Wild, John Williams and Frederick Woon. A further five of the twenty-nine patients were interred in Radcliffe cemetery and have CWGC headstones: Bernard Fitzgerald, Herbert Maddock, Edward Hoppe, Clement Sage and Harry Smith (Fitzgerald and Smith share a headstone). 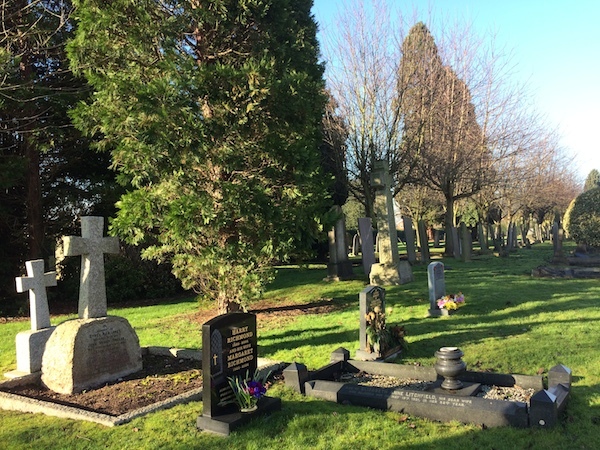 The sixteen deaths of those buried in Radcliffe on Trent cemetery as a consequence of WWI were caused by infectious diseases, cancer, war injuries and mental illness. Respiratory diseases were responsible for eleven of the deaths. Four servicemen died from tuberculosis (TB), a contagious bacterial infection affecting the lungs. Today the illness is treatable with effective antibiotics and the BCG vaccine is given to children and young adults at risk. But these treatments were not available at the time; there were 46,000 TB deaths in 1918 compared with 280 in 2013. 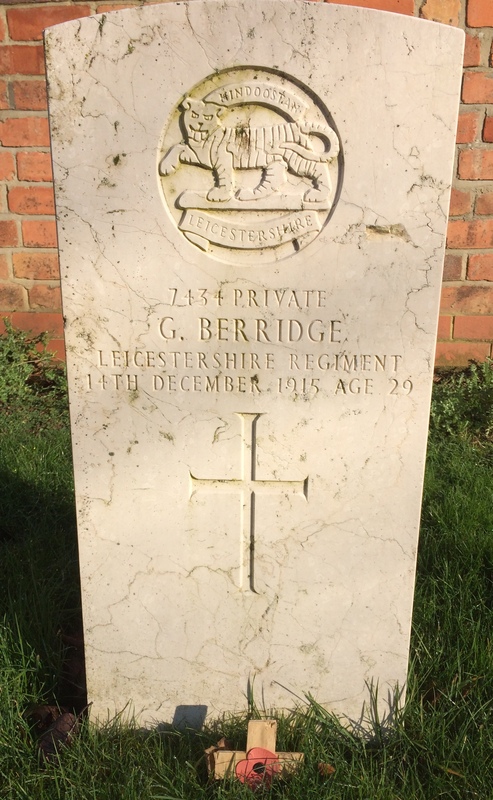 Gordon Berridge (grave reference B.E.120), who enlisted as a regular soldier in 1904 and was working as a reservist at Notts. County Asylum in 1914, was discharged after eight months active service on the Western Front. He was admitted to hospital in May 1915 with TB; his medical report states whether TB was latent in his system before or primarily aggravated in the trenches is impossible to say. He died in December 1915. Less information is available for Edward Upton Bell, who stayed on in the army after 1918 and was then invalided out. His death certificate describes him as an army pensioner who died in 1922 from tuberculosis, age twenty-three. His grave can no longer be found in the cemetery. Wilfred Jackson Taylor (grave reference B.L.148), an attendant at Notts. County Asylum both before and after the war, was dangerously ill in France with trench fever in 1917 and was invalided out of the army with a pension. He died of trench fever and tuberculosis, according to his death certificate, on July 2nd 1921. 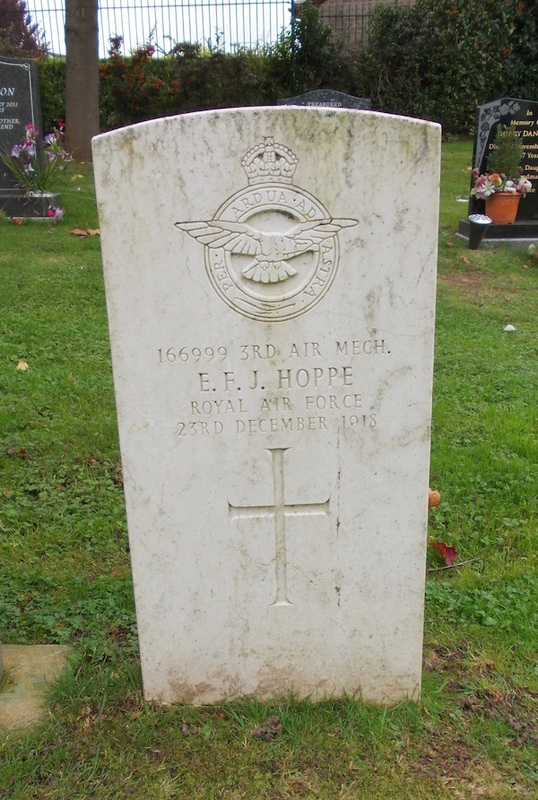 Edward Hoppe (grave reference B.M.259), an air mechanic with the RAF, died from tuberculosis at Notts. County War Hospital in December 1918 following a short period of active service in France. 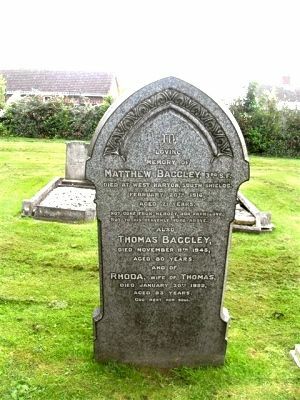 Pneumonia, another respiratory disease, accounted for the death of Matthew Baggley (grave reference B.K.125). 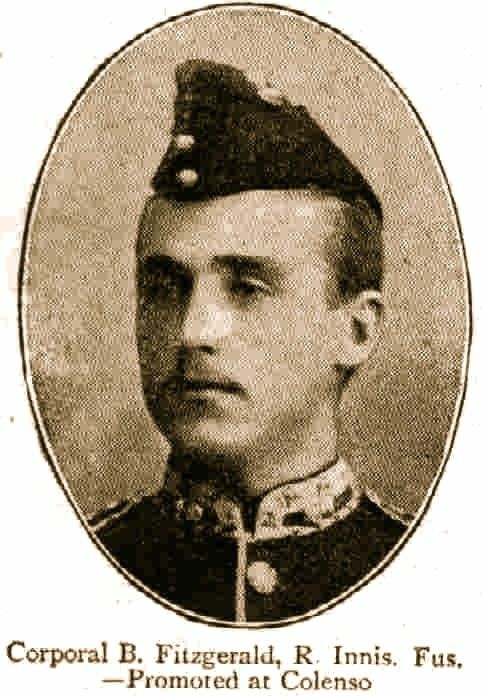 After Matthew volunteered with the Sherwood Foresters, he was sent to Sunderland for training. He died there from pneumonia in February 1916 and his body was brought back to the village to be interred in a family grave. He was twenty-one. The influenza pandemic of 1918 was responsible for the deaths of five of the sixteen WWI personnel buried in the cemetery. It swept through Nottinghamshire, affecting Notts. County War Hospital (temporarily converted from Notts. County Asylum and located in the parish of Radcliffe on Trent) where men suffering from war trauma were being treated. Two of them, Clement Sage (grave reference B.L.260) and Herbert Maddock (grave reference B.M.260), died from influenza at the hospital in November and December 1918 and were given military funerals in Radcliffe on Trent. Elsewhere, thirty-four year old William Brice (grave reference B.L.132) died from influenza in December at Lincoln War Hospital. and his body was brought back from Lincoln to be buried in the village where he was born. His brother Leonard, who served with the Sherwood Foresters, died from TB in Mansfield, Nottinghamshire, in 1923. Daniel Smith (grave reference B.B.116), died from influenza in February 1919 when the pandemic was still raging. He was a married man with two children who had served with the Royal Army Service Corps and returned home to his job as a chauffeur. 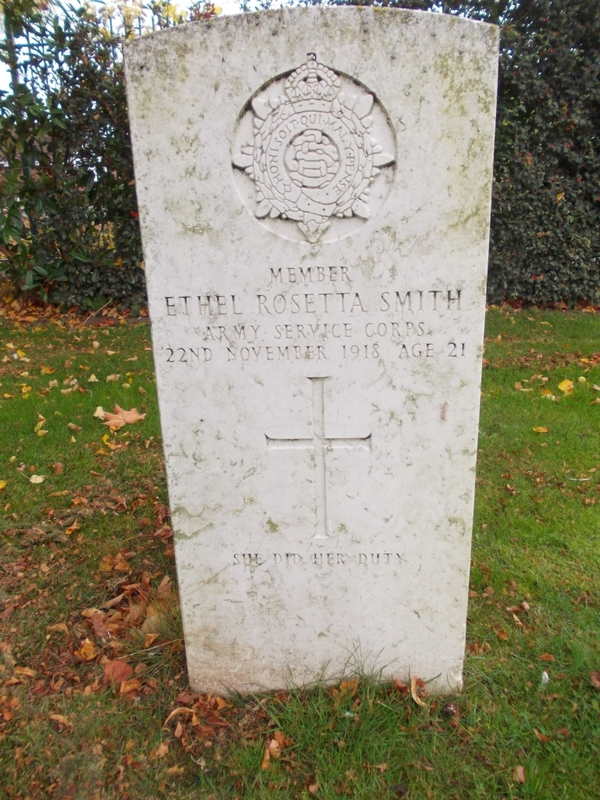 Ethel Rosetta Smith (unrelated to Daniel, grave reference B.O.143), age twenty-one and serving with the Women’s Forage Corps, was another ‘flu victim in Radcliffe on Trent: she died in November 1918. The remaining six of the sixteen deaths are more variable in their causes. Three men died from illnesses which can still prove fatal today despite advances in treatment. 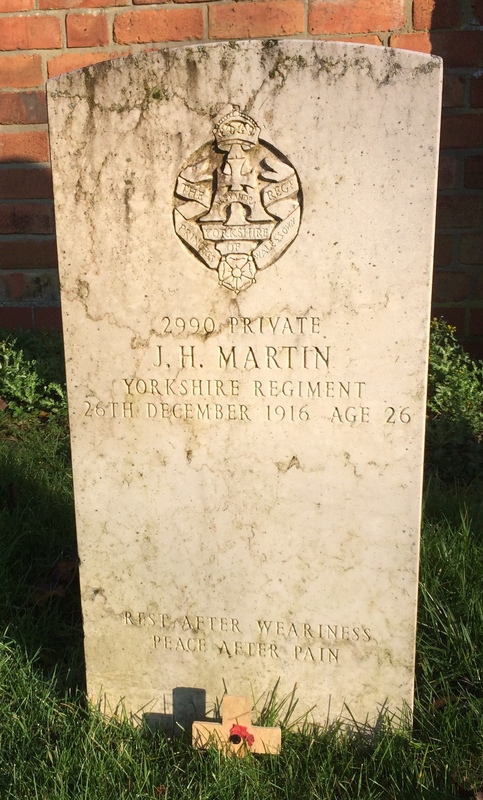 John Martin (grave reference B.E.114), a Poor Law clerk before the war living with his grandparents in Lincoln Grove, served in France with the Yorkshire Regiment. He was discharged from the army in November 1916 and died from meningitis a few weeks later on December 26th. He was twenty-six. 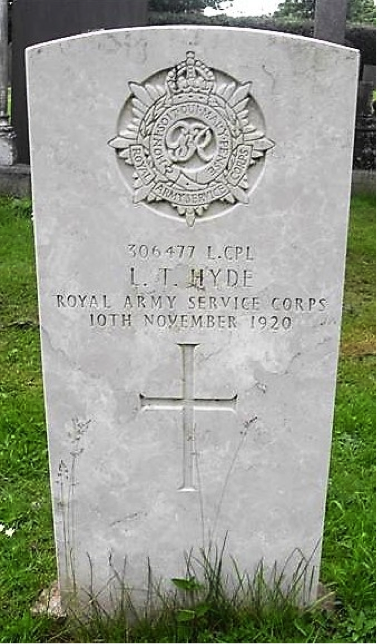 Leslie Toyne Hyde (grave reference A.K.28), and Ernest Taylor Eastwood (grave reference unknown) both died from cancer. Leslie Hyde, a married man with two children, attested in 1915 and remained in the R.A.S.C. reserves at home. By 1919 he had been diagnosed with colon cancer and his wife and children were awarded a military pension. He died in November of that year at the age of thirty-one. Ernest Eastwood joined the Royal Engineers in 1895 with specialist skills as an electrician. He rose through the ranks to become a Sergeant Major; his skills were described as superior and character as exemplary. In 1917 he was transferred to the Royal Flying Corps where he became an inspector with the rank of Lieutenant. Sadly, he died from rectal cancer and metastases of the liver in July 1918. The parish register shows he was buried in the cemetery but his grave can no longer be found. Lawrence Turner‘s family grave (grave reference Y026) is on the right hand side at the Vicarage Lane entrance between the original road and the old walkway. He endured eight years of illness after being wounded at the Battle of Aubers in 1915. When he was discharged from the Sherwood Foresters, he resumed working in his father’s wheelwright’s workshop but his life was dogged by invasive surgery on his hip following gunshot wounds. He had a foreshortened leg, wasted muscles and continuing ill health: he died in 1923 from kidney failure and toxaemia. There is one headstone in the cemetery commemorating a serviceman who died and was buried in France: Frank Barratt Daniels. He was mortally wounded at Mont St. Eloi on April 23rd, 1916. He died three weeks later on May 14th at Le Treport military hospital, having suffered multiple fractures to his spine. His mother and step-father, Alice and Charles William Johnson, visited him at the hospital before his death and attended his funeral. 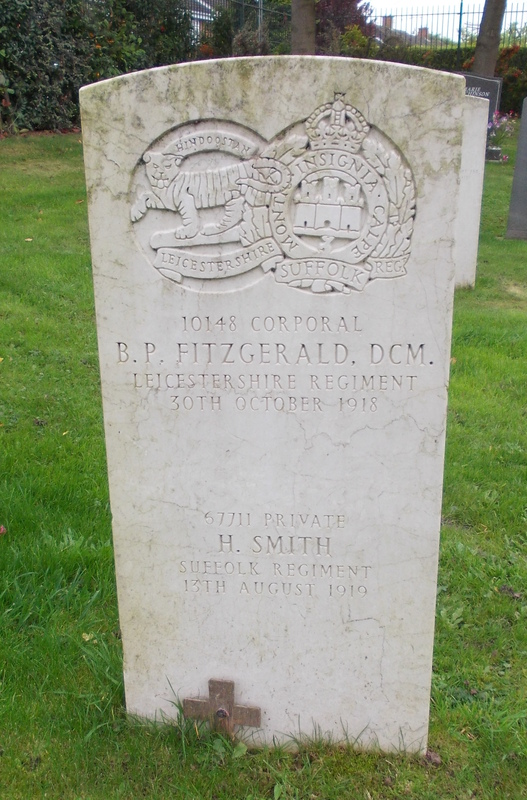 Bernard Fitzgerald and Harry Smith (grave reference B.K.260 for both men) share a common grave and lost their lives as a result of war induced trauma. Both were patients at Notts. County War Hospital. Bernard served in the Boer War. He was discharged after being wounded and was awarded a D.C.M. He is the only person from the ‘WWI cemetery burials’ list for whom a photograph has been found. He was called up in 1914 but never served abroad. His army record shows mental instability and disturbed behaviour at various U.K. barracks from 1915 onwards. He was admitted to Notts. County War Hospital on September 12th 1918 and died seven weeks later on October 30th. The cause according to his military service record was ‘exhaustion following acute mania’. His death certificate provides the same information, adding that his mania lasted two months and eleven days (i.e. he had been pre-diagnosed with mania before his admission). His ‘exhaustion’ lasted for thirteen hours. The actual circumstances surrounding his death will probably never be known, in particular the conditions under which he died of ‘exhaustion’, but he may well also have been a flu victim as there were a number of flu deaths at the hospital within days of his demise. His wife, who lived in Sussex, was informed and she gave instructions for him to be buried in Radcliffe on Trent churchyard. Harry Smith was sent to the hospital in July 1919 from a large military hospital in Southampton for ‘mental observation’. Very little is known about him, other than he served first with the Bedford Regiment and then with the Suffolk Regiment in Egypt. Six weeks later he took his life by hanging himself. According to the evidence of Sister Betsy Todd, the deceased had been confined to a special room as he was termed an ‘escaping patient’. Frequently he had asked if he could do some work, and this he had been allowed. He was quite cheerful yesterday and did his work as usual. Later he was found hanging by two handkerchiefs tied together from a water pipe in the lavatory. The coroner reported his death was due to temporary insanity. He was twenty three. Bernard Fitzgerald and Harry Smith share a CWGC headstone in the cemetery, linked together by their diagnoses of mental illness. Edward Hoppe, another Notts. County War Hospital patient and mentioned above as dying from tuberculosis, is given a second cause of death on his death certificate: exhaustion from mania, two months. Nine of those buried in the cemetery are named on Radcliffe on Trent War Memorial and seven are not. The unnamed are the five patients from Notts. County War Hospital, Wilfred Taylor who worked there (he is named on the hospital memorial) and Ethel Smith who was working temporarily in the village when she died. Nationally, it was common practice for those who died in U.K. war hospitals to be remembered in their hometowns and not where their lives ended. A century later, only a few clues to the identities of those omitted from the memorial remain in Radcliffe cemetery. And sometimes the information on the headstones is incorrect. Herbert Maddock, for instance, died in 1918 according to his death certificate and the cemetery register yet his death date is inscribed as 1916. He has been particularly difficult to trace as his military unit, the Machine Gun Corps, was disbanded in 1922 and the majority, if not all, of the MGC records were destroyed in a fire at Shorncliffe, Kent, in 1920. 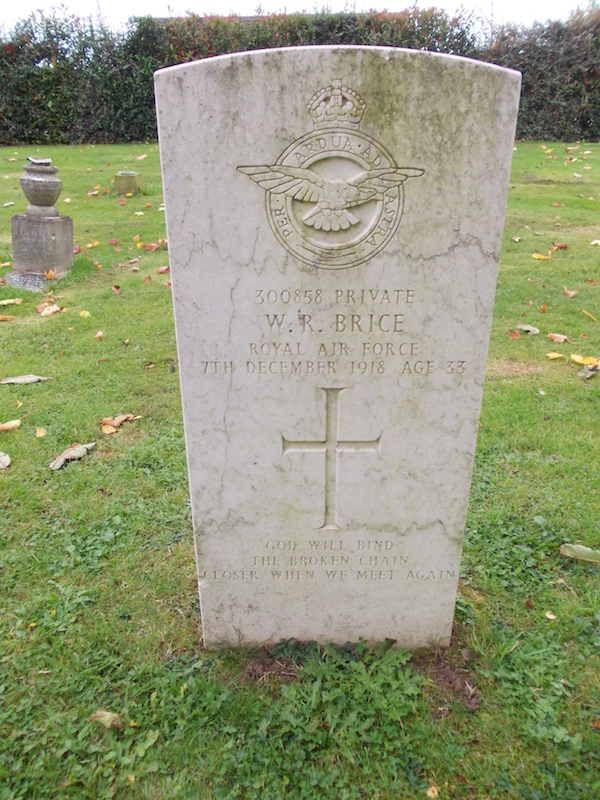 The epitaphs on the Radcliffe on Trent war graves give an indication of relatives’ responses to the deaths. John Martin’s ‘rest after weariness, peace after pain’ suggests he suffered in his final days. Ethel Smith’s terse ‘She did her duty’ and Daniel Smith’s ‘Thy way not mine, oh Lord’ suggest relatives were struggling to accept the deaths of loved ones. 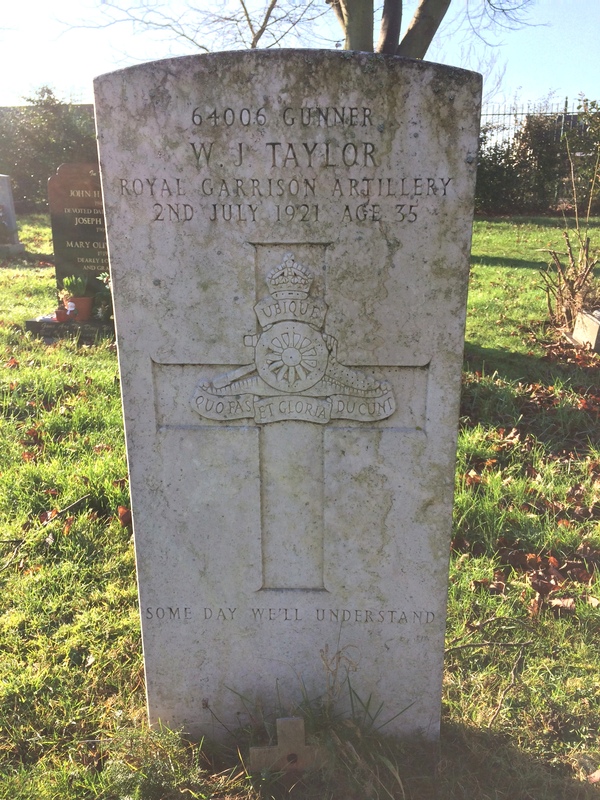 Wilfred Taylor’s epitaph ‘Some Day We’ll Understand’ reflects the preoccupations of historians who have been studying the course and consequences of the 1914–1918 war for the past hundred years. Radcliffe on Trent cemetery also contains several graves of men who fought in WWI and survived, then returned to the village where they continued to live for many years.